The First Multi-label Genderfluid Retail in London! VERV LONDON is the first multi-label retail platform dedicated to fashion that challenges traditional boundaries between menswear and womenswear. 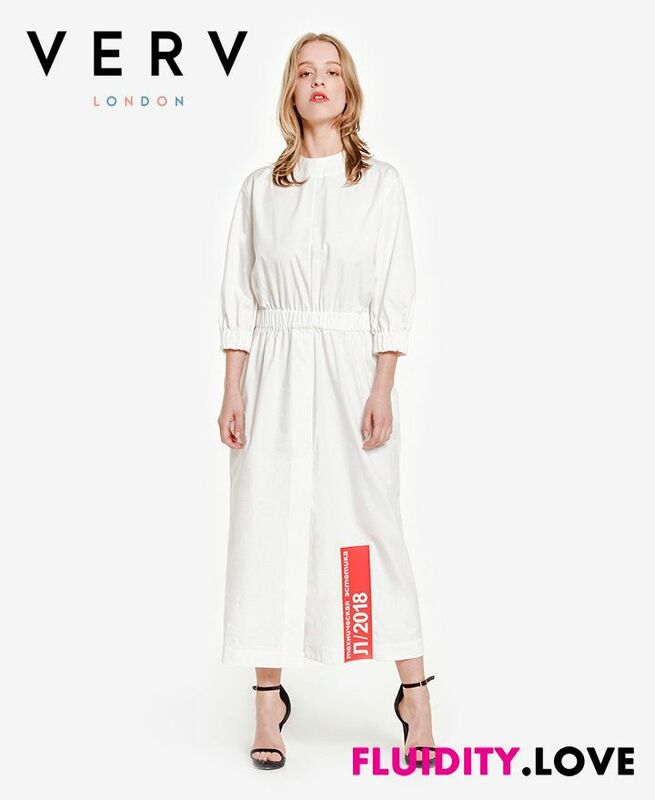 VERV LONDON stocks genderfluid clothing and accessories from emerging brands including DRESSEDUNDRESSED, GEORGE KEBURIA, PALOMO SPAIN and SYRO and is the first worldwide or UK stockist for most of its brands. At the core of VERV LONDON is our determination to challenge gender norms and celebrate individuality and self-expression. We champion fashion that gives a middle finger to traditional gender classifiers. We believe genderfluid fashion represents a new reality where people are not defined by and do not a give a F*CK about their gender and are free to live and dress however they want without conforming to conventional norms. VERV LONDON exclusively features and supports emerging designers from around the world – all our brands are in their first five seasons or less. In fact, the designers behind WINDOW 00 are still students at Central St. Martin and we also presented the graduate collection of 8on8 by Li Gong, from the MA program at CSM. We really want to champion young independent designers. Our goal is to support talent and hard work and provide a platform for designers who fit our social and creative narrative. Behind The Inspiration of "VERV London"
We decided to name our company VERV LONDON to convey the dynamism and creative energy of the city we live in and love so much. London is at the centre of the movement towards androgyny and genderfluidity in fashion and is home to several young designers who are breaking down the barrier between menswear and womenswear. We met each other a few years ago in this city and we have a shared passion for wearing clothes to express our personality and identity. In fact, most of our friends and peers in London dress the same way – they wear clothes that covey their individuality and personal style and simply do not care about gender classifiers. We were definitely inspired by the attitudes and style of our social circle in London and our name is a tribute to the great city and its talented, creative and beautiful citizens. VERV LONDON was founded by us, Sannu Shrestha and Abdul Adama. Sannu is the Managing Director of VERV LONDON. Prior to launching VERV LONDON, he practised as a corporate lawyer for over six years in New York and London. During his legal career, Sannu also worked on many pro bono cases for the LGBTQI community in partnership with the American Civil Liberties Union, Lambda Legal, the Transgender Legal Defense & Education Fund and Immigration Equality. Abdul is the Creative Director of VERV LONDON. He has worked in the fashion industry for several years for emerging and established brands in the UK, Italy, Portugal and Japan. Currently, we handle all aspects of the business ourselves. It is a lot of work but we want to build our company in a way that reflects us personally. We do collaborate very closely with our friends and we are extremely fortunate to have a circle of photographers, stylists and other creatives who have helped us at every stage of our growth. When we first met each other a few years ago, we realised instantly that we were kindred spirits – we each have our own sense of style, but we are both passionate about wearing clothes to express our personality and identity. Gender categorisation – menswear vs. womenswear – is completely irrelevant to the way we dress. Fashion retail, however, is still dominated by gender binaries – whether in a physical or online store, clothing is almost always segregated as either menswear or womenswear. We felt that fashion retailers have been slow to respond to the genderfluid movement in authentic and meaningful ways and we discussed possibly teaming up and starting a platform that focused exclusively on gender-fluid fashion. We therefore started VERV LONDON to become the first multi-label retailer to focus exclusively on genderfluid fashion and our entire product range can be worn by women, men, transgender and nonbinary individuals. vervlondon.com is also the first e-commerce platform that showcases every garment on female, male, transgender or nonbinary model duos. We think this is an extremely important way to break down barriers that exist in people's mind about clothing. We hope our presentation and visuals encourage our customers to experiment with their style and to dress to reflect their individuality and not social expectations. So far, we have not received any hateful criticism or backlash. We are incredibly lucky to be based in a diverse and accepting city like London. That said, we did have issues with some modelling agencies we worked with to cast our models – one agency was peeved that we asked a male model to wear heels and another asked us not to use #queer and #genderfuck as hashtags in social media posts featuring their models! We politely but firmly refused and of course are not working with model agencies ever again. Otherwise, we have actually been really surprised and encouraged by how positive the reaction has been so far. Our Best Moments: So Far! Our proudest moment so far was definitely our campaign in support of the Albert Kennedy Trust, the UK charity dedicated to preventing LGBTQ+ youth homelessness. 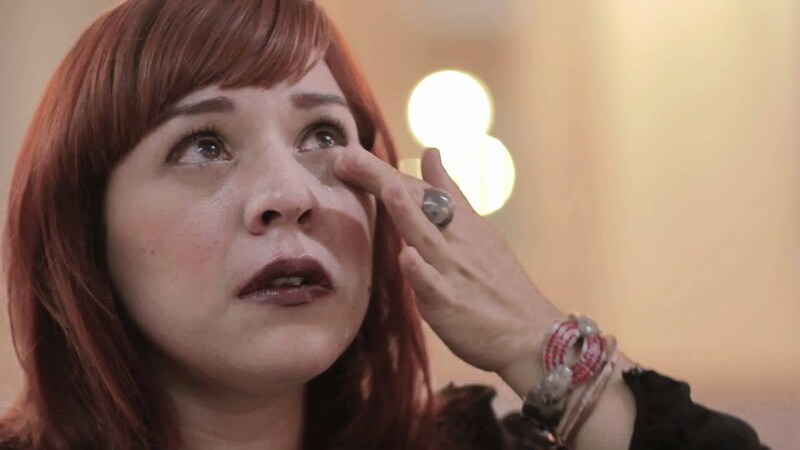 It was our first campaign and it was inspired by our own difficult coming out experiences. We have long admired the work and impact of AKT and the campaign aimed to raise awareness about their important mission. We featured four incredibly brave young people—Anira, King, Parishma and Yuuji—who were helped by AKT in their time of need and the campaign captured the personalities and personal narratives of these diverse individuals. VERV LONDON is committed to supporting the LGBTQ+ community and inspiring organisations such as AKT. As part of the campaign, we are donating 5% of the sales from our entire Spring/Summer 2018 collections from brands such as DANSHAN, PALOMO SPAIN and YULIA YEFIMTCHUK+ to AKT to help and support LGBTQ+ young people because we firmly believe that no young person should have to choose between a safe home and being who they are. We hope to grow vervlondon.com as the go-to platform for gender-fluid fashion. We will continue broadening the diversity of our brands to represent a variety of viewpoints from all over the world. We also want to open a physical store and community space in London in the near future. We recently opened our GENDERFUCK pop-up store this June during London Fashion Week Mens. The store is located at 283 Hackney Road, E2 8NA and will run until 2 July 2018 to showcase the incredible collections of our brands. We collaborated with talented visual merchandiser William Lee and art director Pete Ashworth to create exciting custom installations and window displays. The popup celebrates genderfluid attitudes and aesthetics and features an exclusive exhibition of acclaimed photographer, Åsa Johannesson's "Looking Out, Looking In" series. Åsa has been exploring gender nonconformity and queer identities in her art since 2006 and we are very proud to exhibit her ground-breaking work as part of our GENDERFUCK popup. VERV LONDON's new GENDERFUCK clear tote bag is also available exclusively at the store. 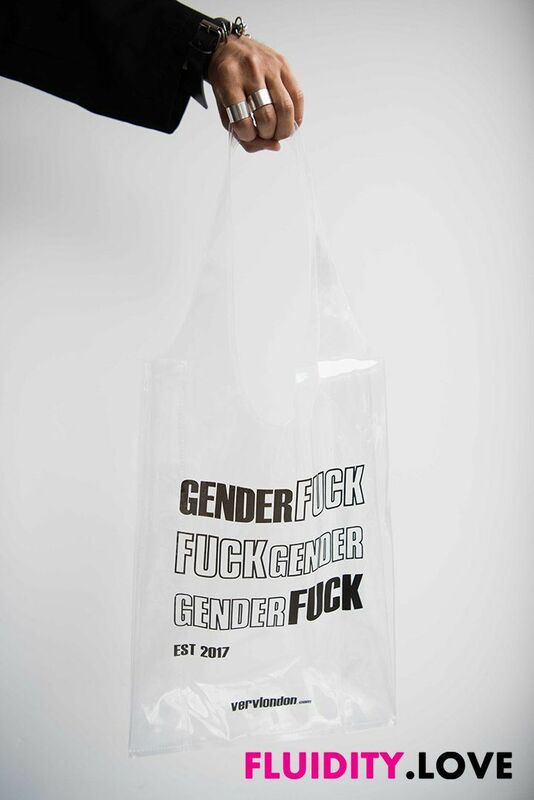 The tote bag is the first item from VERV LONDON's GENDERFUCK collection and we plan to offer a full range of affordable genderfluid clothing and accessories in the near future. We started VERV LONDON to break down the false dichotomy of gender binaries in fashion. Of course, our efforts do not encompass just fashion and we hope to contribute to increasing the visibility of queer, transgender, gendernonconforming, nonbinary, genderfluid and other beautiful individuals along this spectrum. It is important that the identities and rights of these individuals are respected by the fashion industry and society in general. Even people who do identify as cisgender female or male no longer want to be confined to narrow conventional definitions of femininity or masculinity. We hope to see a future where the individuality and self-expression of all individuals are respected and celebrated.